Dayton Sends Third-Seeded Syracuse Home Early In NCAA Tourney : The Two-Way In a nail-biting final minute of Saturday's game, 11th-seeded Dayton put away third-seeded Syracuse 55-53. Syracuse's Trevor Cooney (No. 10) shoots between Dayton's Devon Scott (second from left) and Dyshawn Pierre (right) as Khari Price (left) watches during the first half of a third-round game in the NCAA men's college basketball tournament in Buffalo, N.Y., on Saturday. In an NCAA men's tournament that has surprised many with early upsets, the University of Dayton kept the run going by taking out third-seeded Syracuse 55-53 on Saturday. 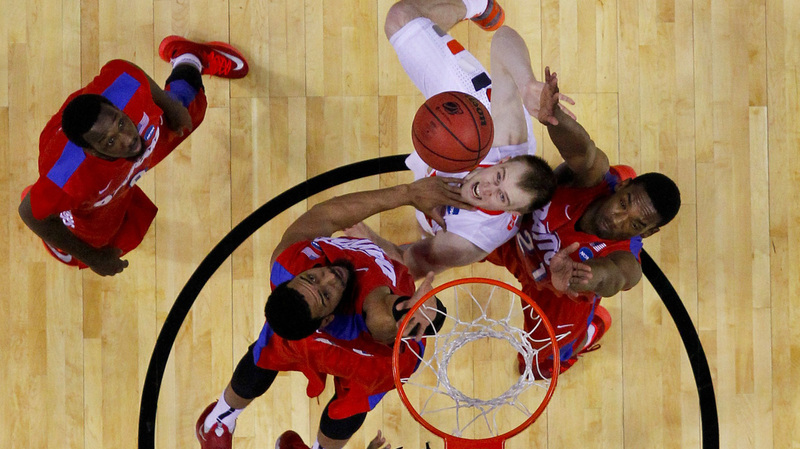 As SBNation reports, the win puts the Dayton Flyers into their first Sweet 16 since 1984. Dayton was up by six points in the final minute, which turned into a tense, slow crawl from Syracuse, at one point bringing the game within a point, as the team tried to pull together a winning play. And it almost did, with a 3-pointer in the air at the buzzer from Syracuse's Tyler Ennis. The clang of that shot against the rim, however, sealed their fate and the upset. Dayton will face the winner of the Stanford (No. 10) vs. Kansas (No. 2) game on Sunday.